President Donald Trump tweeted a video showing him tackling and punching a man with the CNN logo imposed over his face. The video appears to have come from forum frequented by “alt-right” Trump supporters who posted it days earlier. 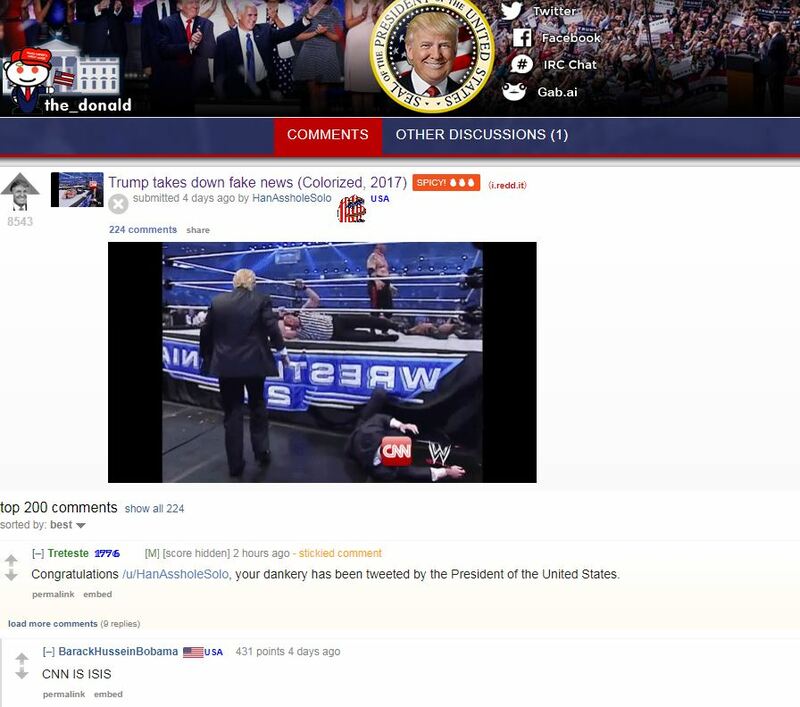 The Reddit forum “r/The_Donald,” where “alt-right” members supporting Trump congregate, posted a GIF four days prior that seems to be the same footage. Oh, come on, folks. Do any of you think Teflon Donnie is smart enough to come up with this imagery by himself? The man can barely thumb a coherent Tweet! Trump’s lame Reddit tweet lacks the same degree of vision and originality as the rest of his administration. Trump’s phony wrestling stunt merely presaged the actual assault, and re-enacted it for the “amusement” of his surly mob. Laugh it up r/The_Donald users. It’s going to be hilarious to listen to you whine when he shuts down free access to the Internet. Authoritarians don’t like anything they can’t control. Oh, your tears will be so funny. I have the world’s tiniest violin here, all ready to go. Donald Trump has devoted most of the past two weeks to discussing immigration, even though only 8 percent of Americans rank it as “the most important problem facing this country today,” according to a recent Gallup poll. 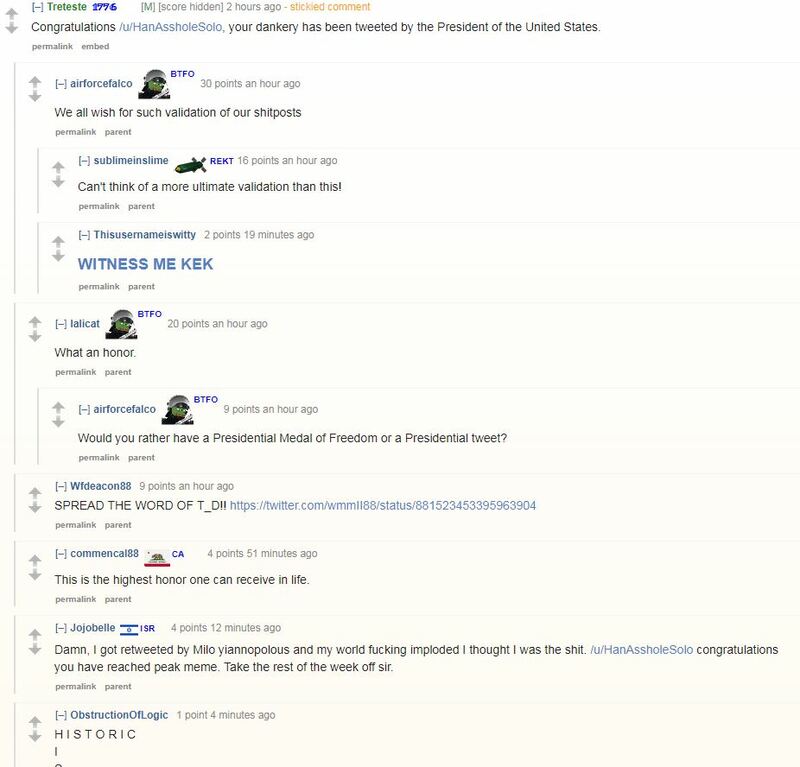 The term was coined in 2008 by Richard Spencer, a white supremacist whose National Policy Institute says it is “dedicated to the heritage, identity and future of people of European descent in the United States, and around the world.” Through his online writings and YouTube channel, Mr. Spencer is a key player in the social-media universe where this core group of Trump supporters get their “news,” from sources with which most people aren’t familiar. A quick scan shows that immigration is not only their most important issue, it’s pretty much their only issue. who are undergoing a painful recognition that, unless dramatic action is taken, their grandchildren will live in a country that is alien and hostile,” Mr. Spencer wrote in a National Policy Institute column. We needed that — especially for the Trump supporters who insist that the Alt-Right has nothing to do with race, and are adamant that Trump has nothing to do with the Alt-Right — or any bigotry whatsoever. And not just Trump; Pence and a good portion of Trump’s campaign staff and even cabinet are guilty of treason and should be jailed. Liberals should be deported or jailed as TERRORISTS. The diaster is gone. That was Emperor Obama that was distroying America. PRESIDENT TRUMP is bringing America back to where she should be. “…America back to where she should be,” kep? We’ve seen how Trump treats women. Why do you advocate insulting the United States? In your view, is your nation a pig, a dog, or “dumb as a rock”, “bleeding” from godknowswhat? Do you advocate for physical assault, by Trump, of the United States? Grabbing her most private areas, mauling her, and threatening to sue her into financial ruin if she complains? This is Trump’s first presidency. Do you encourage him to toss us aside and take up with a younger country in the next few months, campaign and run for office over there while he’s still the narrowly elected Executive right here? Go back to ISIS, kep. You’re late for the We-Hate-the-USA meeting. Yeah, I see how PRESIDENT TRUMP treats women as equals, and places them into positions of power. He is doing EXACTLY what he was hired to do. He is bringing REAL change to Washington, something liberals can not stand because they are no longer relevant. Go back to your Mother Russia, Comrade. You are no longer welcomed in America. “…TRUMP treats women as equals,” to subordinates, “and he places them into positions of power.” Like limo drivers, baggage handlers, or valets enjoy positions of “power”. Trump wasn’t “hired”. Most US voters chose his opponent. “He is bringing REAL change to Washington,” in the form of unabashed obstruction of justice, flagrant malfeasance, and undisguised contempt for every word of his oath he swore. He is now kissing his brother-from-another-mother, Mother Russia. And you are a loyal co-conspirator in Trump’s assault of American democracy. You are brainwashed into believing the liberal propaganda and lies. Try some truth for a change. I was “brainwashed” by Trump’s debate performances, speeches, interviews, and tweets. What a silly fool Trump is. The USA is humiliated to the core.